For over 30 years, artisan Clark the Carver of Carve Me A Bear Chainsaw Carvings! has been hard at work producing beautiful pieces of sculptures armed with his trusty chainsaws. Creating diverse pieces from charming animals, to furniture, to name signs, and so much more, Carve Me A Bear Chainsaw Carvings! 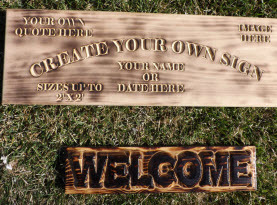 of Las Vegas, Nevada and Helena, Montana offer ready-made wood sculptures or we can accommodate you with custom orders. 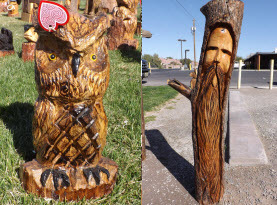 Clark the Carver can even transform the old stump that is marring your landscape into a delightful carving that accents your home or business as well as your personality. 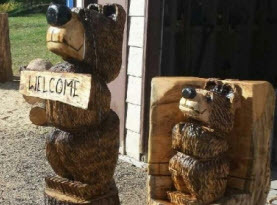 Whether you are looking for something exquisite in your own collection or finding the perfect gift; Carve Me A Bear Chainsaw Carvings has the unique gift you are looking for! History of North American Mountain Men; What Did they Do for a Living, Hunt, Wear & Carry? Among the many subjects Clark the Carve of Carve Me A Bear Chainsaw Carvings can whittle a chunk of wood with his chainsaw, is mountain men. 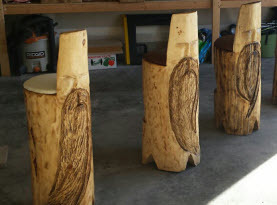 Having some mountain men watching over your home or business is the perfect conversation piece that adds charm and intrigue to any foyer, reception area or landscape. There are quite a few people that are partial to the impressive, burly nature of mountain men. And why not? A mountain man is a male trapper, living in the wilderness that takes exploring to the next level. From about 1810-1880s Mountain Men were very common in the United States, particularly roughing it in the Rocky Mountains. During the 1840s, this was a fairly populated area among mountain men. With their skills and diligence, they were helpful in opening the various Emigrant Trails that permitted the Americans from the East coast to settle in the new territories far out west. They would make a living by trapping and supplying the economy with fur. But eventually the demand would fall with too many mountain men trapping. With approximately 3,000 mountain men applying their skills in the Rockies between 1820 and 1840, the mountain men were actually employed by major fur companies. Their lives were nearly militarized; hunting and trapping in groups and had a head leader of the trapping party. The leaders were referred to as the boosway, stemming from the French term bourgeois. He was dubbed the leader of the brigade, which included being the head trader. Mountain Man Chainsaw Carved Art; What Did Mountain Men Look Like? The mountain men had no stereotype. Being quite diverse in religious practices and having various ethnicities and social habits, no one could necessarily assume they came into contact with a mountain man. The majority of mountain men originated from Canada and the US, along with Spanish-governed territories in Mexico; few were European immigrates. Most mountain men were motivated by the once lucrative profit, before the sudden drop in fur, but some would enjoy exploring the West as they traversed the mountain lands. If one did stereotype these highly intelligent and capable men, they were romanticized as honorable and chivalrous, loners that felt more at home in the wild; while wearing buckskin and coonskin caps with long wiry beards, accessorizing with rifles and bowie knives. But in actuality, few foraged the land alone, sticking to groups and staying warm in woolen hats and cloaks. With mountain men being thought of being warriors in one’s mind; strong, fearless, and skillful, many folks find their lifestyle choice amazing. If you or a loved one is among these people that hold mountain men in the high regard they so deserve, Clark the Carver of Carve Me A Bear Chainsaw Carvings! can design his own masterpiece or take custom orders for your mountain man sculpture.